Matte lipsticks are everywhere and whilst my collection tends to lean more towards Liquid Lipsticks from the likes of Maybelline and Revlon I don’t own very many straight forward matte lipsticks. 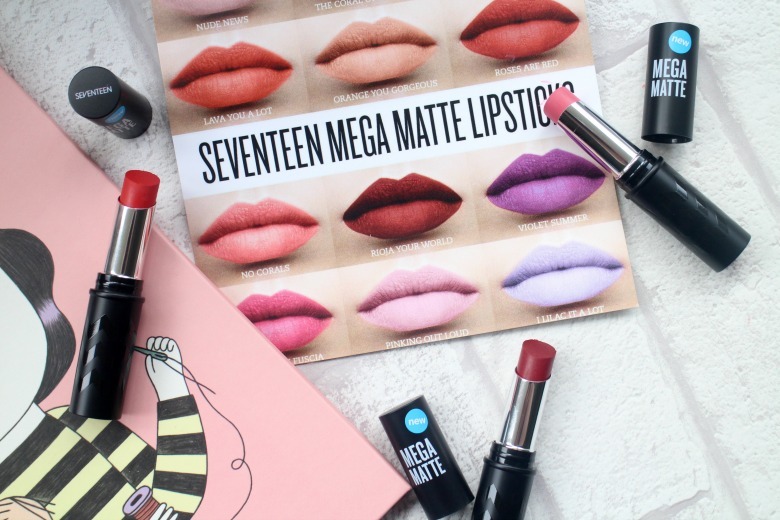 Enter the new Seventeen Mega Matte Lipsticks* and their twelve strong line of shades which I was lucky enough to pick three favourites from to try. Seventeen Mega Matte Lipsticks promise to glide on smoothly providing a bold and intense matte lip, with a non-drying and creamy formula which will last up to 13 hours. 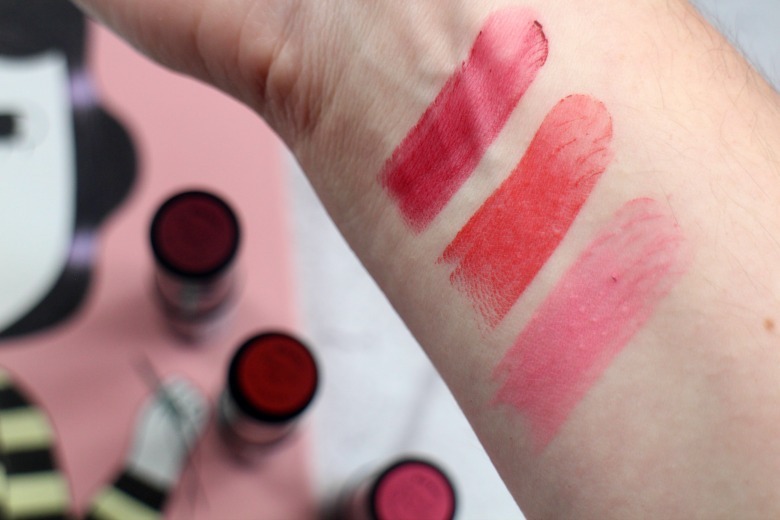 The question is, for £3.49 each does this budget friendly matte lip meet these claims? The first shade I tried was, Roses Are Red* and I was overwhelmed with how pigmented it was. I have found each of the shades a little stiff and dry when I first applied but on the lips I’m not experiencing any dryness. I won’t go so far to say it’s ‘creamy’ but there are definitely not drying. In comparison I’ve found them to be less drying that the SephoraMatte Lip Creams. The shade of red was just what I like, true red and there’s nothing I like more than a matte red lip. As for wear time I’ll site my usual disclaimer. I’m a smoker so you can always discount longevity on the lips as a factor in my reviews although compared to many other products I did find that it stuck around on my lips a lot longer and wore in the middle slower than I’m used. A deeper shade of red and one for those who love the look of ‘red wine lips’ is Rioja Your World*. I’ve tried this only to see how it looks on and love it. Being such a deeper shade I will be putting this on hold to wear come Autumn. The shade getting most attention from me at the moment is Coral of the Story*. 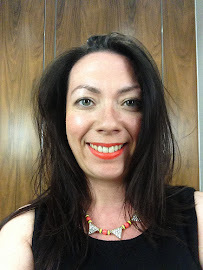 This reminds me a lot of RimmelEast End Snob Lip Liner and is not what I’d call a coral but simple ‘pink’. It’s the perfect matte pink shade that can be worn with anything. I’m slightly more cautious with the lighter shades in matte form although I have found this to be very wearable and if I feel like I want some shine I add my NYXButter Gloss in Éclair. Seventeen helpfully provide some ‘instructions’ on how to get the most out of your Mega Matte Lipsticks which include the obvious steps of exfoliating your lips, using a liner and apply with a lip brush which I’m definitely keen to try for the darker shades. I always struggle with lipsticks when they’re flat and round, whilst these are perfect size for the bow of my lips I find it’s quite awkward to apply than the typical bullet shape so I think working with a liner and brush will help achieve a perfect application. Are you a matte lip fan? I love a high street bargain!